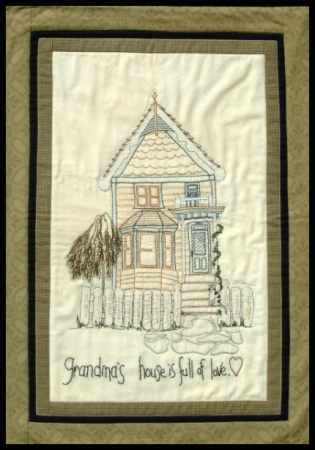 Measuring 19" x 25", this hand-stitched wall hanging reminds us that "Grandma's house is full of love." Bordered & machine quilted, you'll love this old-fashioned house with all it's character detail, from the balcony & bay window to the flagstone walk & picket fence. All patterns include a thread chart & use four basic stitches: Backstitch, Running Stitch, French Knot & Lazy Daisy.